This offering features a chapter titled "The Bladeless Turbine" by C.R. Possell and a compilation of Tesla's "Fluid Propulsion" patent application, including amendments. Also included is the "Valvular Conduit" patent, containing, among other things, Tesla's own operational description of the bladeless gas turbine and an abridged version of his 1931 article entitled "Our Future Motive Power" which describes a plan for converting the heat of the earth itself into electrical energy. 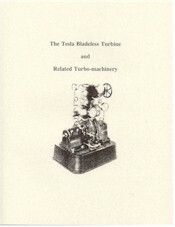 The book has 21 mechanical drawings of Tesla engines and pumps, plus photos. It is a good primer for anyone interested in learning about this "monarch of machines." "The theoretically perfect turbine would be one in which the fluid was so controlled from the inlet to the exhaust that its energy was delivered to the driving shaft with the least possible losses due to the mechanical means employed. The mechanically perfect turbine would be one which combined simplicity and cheapness of construction, durability, ease and rapidity of repairs, and a small ratio of weight and space occupied to the power delivered on the shaft." "A new idea must not be judged by its immediate results. My alternating system of power transmission came at a psychological moment, as a long-sought answer to pressing industrial questions and altho considerable resistance had to be overcome and opposing interests reconciled, as usual, the commercial introduction could not be long delayed. Now, compare this situation with that confronting my turbine, for example. One should think that so simple and beautiful an invention, possessing many features of an ideal motor, should be adopted at once and, undoubtedly it would be under similar conditions. But the prospective effect of the rotating field was not to render worthless existing machinery; on the contrary, it was to give it additional value. The system lent itself to new enterprise as well as to improvement of old. My turbine is of a character entirely different. It is a radical departure in the sense that its success would mean the abandonment of the antiquated types of prime movers on which billions of dollars have been spent. Under such circumstances the progress must needs be slow..."
With three quarters of a century having passed, perhaps now is the right psychological moment. . . .